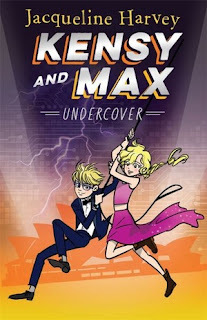 This is the third book in a series about twins, Max Grey and his sister Kensington who are undercover agents-in-training at Pharos, a covert international spy network. In the first book, the twins’ lives are turned upside down when they are whisked off to London and discover their parents (both agents) are missing. In attempting to uncover the truth, strange things happen as they enter a weird new school, come across bizarre grannies on their street, and keep finding coded messages and adults who keep secrets. Who can they trust? In the latest book of the twins’ adventures, the prolific Australian author Harvey helps any reader new to the series with clues at the front of the book: two maps, one of Sydney, the other of Cherry Tree Farm. As well, there are three comprehensive pages of the cast of characters (so many! ), and then over seven pages of ‘Case Note 17’ which fills the reader in on what has preceded the current book. Again, these notes are comprehensive and filled with characters and places, recounting fieldwork undertaken by the twins, their skills, strengths and vulnerabilities, their training and more. This is a lot to take in before moving on to the current state of play. 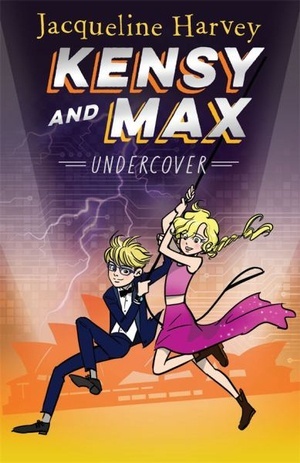 The Undercover book starts with Kensy and her science partner in class almost burning down the lab and causing the evacuation of students. The next chapter switches to (Granny) Cordelia Spencer, who, the earlier notes tell us, is a Dame and Head of Pharos. More characters appear…There’s so much to take in. Next Granny ships the twins off from England to Australia on an undercover mission. There the two are enrolled in a posh Sydney school where their spying skills are used to infiltrate and befriend students. Every chapter of the book begins with an incomprehensible row of letters: if the reader wants to decipher them, there’s a code-breaker at the back of the book. Many characters, twists and turns, mysteries and fast-paced action: these abound in this book which no doubt will be followed by yet another in the series. Suitable for ages 9+ years.